A dental crown is a tooth-shaped cap that fits over your existing teeth or dental implant. 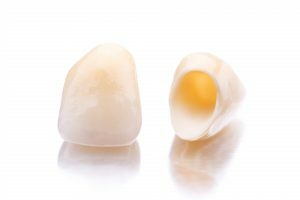 It is made of a durable, biocompatible dental-grade porcelain that blends in with your natural teeth. Fit – Your dental crown will fit correctly, which means that it will come down to the gum line like your natural crowns do. Match – Another sign of a good crown is that it will match the surrounding teeth in contour and shape. This is important because all your teeth have a symbiotic relationship with each other, meaning their shape, contour, location and spacing are all relative to each one’s contribution to the function of your entire jaw structure. Proper Contact – This too, is very important for functionality. If the crown is placed properly, you will make the right contact with your food when you bite down and begin chewing. You should not be aware of the tooth, individually, when you are eating because perfectly functioning teeth just do their respective jobs. If you are aware of the tooth, though, it’s a sign that something may be wrong with your crown. Color – Although this deals more with aesthetics, it still is a measure of the quality of the dental work you’ve received. Your crown should blend in with the rest of your teeth. A bad crown is one that doesn’t at least meet the criteria listed above. The litmus test for any dental work is, “Has it restored my function to the fullest measure that the procedure is capable of delivering?” If it has not met these objectives, it is a failed procedure. It’s difficult to determine which dentist is proficient enough to deliver the quality care that you need and deserve. That’s why it’s important to empower yourself by getting educated through channels such as this. Then, reach out to your dentist in Lancaster, TX to schedule an initial consultation to learn more about how she can ensure that your experience will be positive, and the care provided superb. Dr. Mahima Gupta completed her dental degree and one year of residency in India. After taking time to broaden her insight and gain experience, she went on to earn her Doctor of Dental Surgery degree from New York University. She practices at Lancaster Family Smiles and be reached for more information through her website.